94 people were killed after a ferry sank in the Tigris River of Mosul, Iraq. Most of the people who got killed in the incident were children and women. The Interior Ministry said that there were around 200 people on the ferry. The ferry was on its way to the Umm Rabaen Island, a tourist island that is about 4 kilometers north of the city center. The people on board the ferry were celebrating Nowruz, the new-year festival. The Civil Defence Agency of Mosul said that most of the people on board did not know how to swim. 94 people which include 19 children and 61 women were killed in the incident, officials rescued 55 people. Video clips showed the ferry tilting to the right before it sank completely, the video also showed how the ferry was draggy downstream by the fast-flowing river. Helicopters and Ambulances were deployed to the river to help survivors and retrieve the bodies of those people who passed away in the incident. Local authorities warned the people about the rising water levels in the river after they opened the gates of the Mosul Dam, a lot of people are accusing the ship operator for ignoring the warning from the authorities. 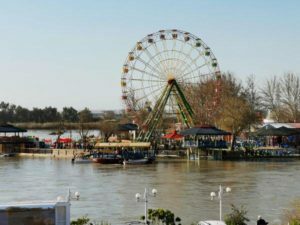 The Justice Ministry of Iraq has ordered immediate arrest of 9 company workers of the ferry, owners of the ships, and the owners of the tourist site. Adel Abdul Mahdi, the Prime Minister of Iraq has ordered investigations that will help them determine responsibilities. PM Abdul also went to a hospital and a morgue in Mosul, he also declared 3 days of national mourning. Iraq’s Special Representative for the United Nations, Secretary-General Jeanine Hennis-Plasschaert said that the incident was a terrible tragedy.